The seminar will cover the upcoming revision in cleanroom standards (ISO 14644, U.S. FDA c GMP, EU GMP revised Annex 1, WHO). Hands on portable Particle Counters, online particle counter, Aerosol Photometers, High Pressure Diffuser, Air Velocity Meter, Air Capture hood. Mr.Tim Russell is the Global Product Manager of the TSI Controlled Environments business and is currently transitioning into the role of Business Director at TSI. With 32 years of experience in designing Air and Liquid borne particle counting and facility monitoring systems, Tim has been instrumental in developing the whole clean room facility Monitoring Systems Solutions. P-MEC India 2019 is an international exhibition on pharmaceutical and medical devices and their accessories. P-MEC India will take place on 3 days from 26-28November, 2019 in Delhi NCR, India. 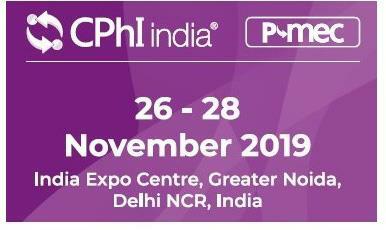 P-MEC India 2019 is co-located with CPhI India, a sister brand of CPhI Worldwide - the "must attended" event in the international pharmaceutical industry. Into its 6th year, P-MEC India and its co-located events are the largest and most comprehensive pharmaceutical industry events in South Asia. P-MEC India Mumbai is a great platform for you to Meet with key decision makers in pharmaceutical industry from over 85 countries, including India, China, US, UK, France, Italy, etc. Network and build your brand in one of the world's fastest growing pharmaceutical markets.P-MEC India is a great platform for you to: Showcase high-quality pharma machinery and equipment; Meet with key decision makers in pharmaceutical industry from over 85 countries, including India, China, US, UK, France, Italy, etc., Network and build your brand in one of the world's fastest growing pharmaceutical markets.